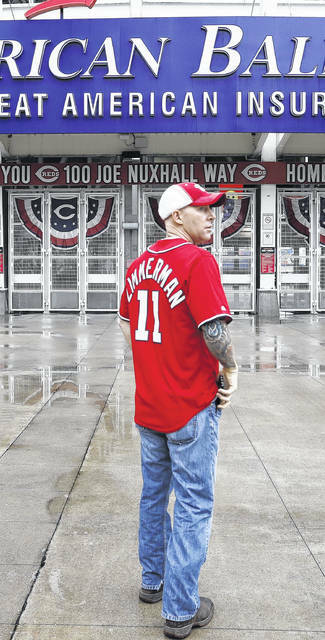 Washington fan Joshua Adam Beach stands Thursday outside the front gates of Great American Ballpark in Cincinnati where the Reds-Nationals game was postponed until today. Groundskeepers place a tarp Thursday on the field at Great American Ballpark in Cincinnati where the first game of the regular season between the Reds and Washington was postponed due to rain until today. CINCINNATI — Closer Raisel Iglesias skirted the tarp-covered infield along with the rest of the Cincinnati Reds pitchers, heading for the outfield and a quick game of catch before the rains returned. That’s as good at it would get on this opening day in Cincinnati. 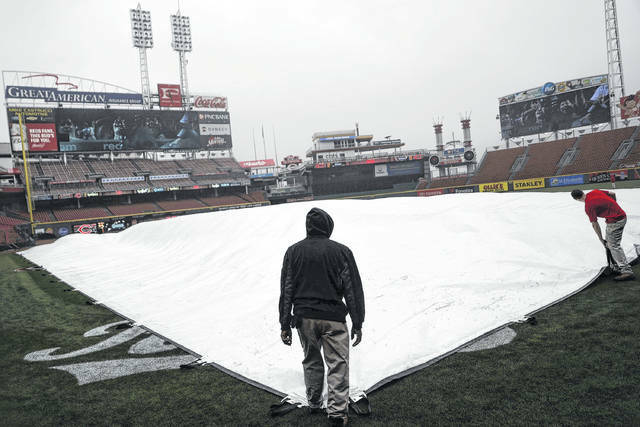 The Reds had to call off an opener because of weather for the first time since 1966. It’s already an unusual start to the season in the place where professional baseball began in 1869. The traditional opening day parade was pushed back to Monday because the sponsors are busy with their Easter weekend business. So the celebration of baseball’s return will last a weekend instead of only one day. Although there wasn’t much on the field other than the tarp, the Reds were busy patching up an already injury-sapped roster. Anthony DeSclafani went on the 60-day DL with a strained left oblique suffered during spring training, the third year in a row that he’s sidelined by a significant injury. He hasn’t started throwing yet. “Definitely not how I wanted to start my Reds tenure,” Hernandez said. Homer Bailey (6-9) will start Friday afternoon against Washington’s Max Scherzer (16-6), who has won the last two NL Cy Young awards. The forecast is for a dry afternoon with temperatures around 50 at game time. Washington went into last season with an unsettled back end of the bullpen and the results were disastrous. General manager Mike Rizzo rebuilt it during the season by acquiring left-hander Sean Doolittle and righties Ryan Madson and Brandon Kintzler. They’re all back, giving first-year manager Dave Martinez a comfort level. The Reds called up left-hander Cody Reed to fill Finnegan’s spot in the rotation. He’ll face the Cubs next Tuesday. Right-handed reliever Jackson Stephens and utility player Cliff Pennington were added to fill out the roster.